According to the National Fire Protection Association (NFPA), an arc flash is “a dangerous condition associated with the release of energy caused by an electric arc.” Explosions associated with arc flash can cause severe burns, injuries and/or death. Understanding arc flash is the first step to guarding against it. Radiant Heat: Temperatures associated with arc flash can exceed 35,000º F at the arc source. This temperature is nearly four times the temperature of the Sun! At these temperatures, matter instantaneously vaporizes. Fire: A conductive-plasma fireball can develop during an arc flash. Fatal burns may occur at distances of more than 10 feet from the source of the flash. In addition to burns, flammable clothing may ignite. Arc Blast: The high temperatures associated with arc flash rapidly heat the surrounding air causing a high-pressure wave or blast. Injuries associated with blast include falls, concussions and hearing damage. Flying Objects: Flying debris created by damaged components can also cause serious injury. In the heat of an arc flash, copper can expand by a factor of 67,000 times as it vaporizes. Shrapnel and molten metal can cause injuries at significant distances from an arc source. Thermographer safety is one of the many topics covered in the Infraspection Institute Level I Certified Infrared Thermographer® training course. For more information including course locations and dates, visit Infraspection Institute online or call us at 609-239-4788. As interest in building remediation has increased, thermography has become a common tool for helping to detect moisture damage. Knowing when and how to conduct an infrared inspection is key to success. Water infiltration into buildings can have devastating effects on building materials. Left untreated, latent moisture can cause excess energy loss, mold growth and/or structural failure. Latent moisture also causes changes in the thermal capacitance and conductivity of materials. Prior to performing an infrared inspection, determine the best vantage point for imaging. Insulated roofs and exterior building finishes such as EIFS are traditionally inspected from the exterior of the building. Interior inspections are usually effective when moisture is affecting interior finishes of the building such as drywall. Thermal imaging may not be effective for low emittance targets. Next, choose an appropriate time to ensure that a detectable Delta T will be present. For roofs and building exteriors, best results are usually obtained during evening hours following a sunny day. As an alternative, inspections may also be performed when there is an inside/outside temperature differential of at least 10Cº. In some cases, inspections performed from the interior may be performed with a smaller Delta T.
Thermal signatures associated with latent moisture will vary with type of building material and the amount of moisture contained therein. Depending upon vantage point and time of inspection, exceptions caused by latent moisture may show as either hot or cold thermal anomalies. These anomalies may be amorphously shaped, mottled, or correspond to the size and shape of absorbent materials. All thermal data should be correlated with invasive testing to ascertain moisture content of inspected areas. 1. Determine your imager’s Field of View (in degrees) from the manufacturer’s specs. 4. Multiply number in Step 3 by distance from imager lens to object. 5. Multiply number in obtained in Step 4 by 2. This will be the width of the imager’s field of view at the specified distance. Example: Calculate field of view for 16° lens at 25’. A perpetual quest among professional thermographers involves seeking a standard contract for their inspection services. In this Tip, we offer a time-tested solution that can help to increase sales and improve customer satisfaction. A contract is a binding legal agreement that is enforceable in a court of law. Simply put, a contract is an exchange of promises, which if broken, have remedy in the law. Among other things, an infrared inspection contract should address the responsibilities of the thermographer and the client, work to be performed, applicable standards and procedures, pricing, delivery, and payment terms. Due to the diverse nature of infrared inspection services, preparing a one-size-fits-all contract can be very difficult. This challenge becomes even greater when ancillary services such as providing electricians or moisture verification are required as part of a project. In many areas, preparing a contract requires the assistance of a legal professional in order to ensure that the final contract meets all regulatory and legal requirements. For professional thermographers, the first step in approaching any new project should be to generate a formal proposal. This proposal should contain all information pertinent to the project and be sufficiently detailed to reflect the responsibilities of all parties including the client and the thermographer. Once a proposal has been deemed satisfactory by a client, a Purchase Order or contract may then be prepared and forwarded to the thermographer for review and acceptance. Infraspection Institute offers standard proposal templates for several different types of residential and commercial infrared inspections. Each template provides suggested wording and format for preparing a comprehensive and professional proposal. Eight proposal templates are currently available covering the following applications: electrical systems, mechanical systems, electro/mechanical systems, building envelopes, insulated roofs, process equipment, steam traps, and underground piping. Each template outlines scope of work, pricing options, client and thermographer responsibilities, applicable standards, additional services, and terms. All templates are provided in a Microsoft Word file and can be modified to suit the user’s particular needs. Templates may be used as core language for contract documents. Purchase price includes license for unlimited use of template by the original purchaser. Templates are available individually or as a complete set of eight through the Infraspection Online Store. We’ve all heard the phrase, “A chain is only as strong as its weakest link.” When it comes to thermography, the weakest link is frequently not the test equipment but rather the thermographer. All too often, many facility managers are led to believe that infrared imagers are fully automatic instruments that require nothing more than “point and shoot” operation. While thermography is a science, it is also an art or craft requiring a skilled human operator for both conducting the inspection and interpreting the data obtained. In order to achieve maximum effectiveness, thermographers need to have an understanding of infrared theory, heat transfer concepts, equipment capabilities and limitations, and environmental conditions, as well being knowledgeable about the system(s) being inspected. Whether you are setting up an infrared inspection program or maintaining one, thermographer training should not be overlooked. Obtaining quality training is an investment that can pay huge dividends by maximizing the effectiveness of thermographers and eliminating your weakest link. Infraspection Institute offers Level I, II, and III training and certification for thermographers worldwide. Our infrared training programs meet the requirements for training of NDT personnel in accordance with the ASNT document, SNT-TC-1A. When performing quantitative thermography in areas with high ambient temperatures and strong, multiple sources of radiant energy, it is important to pay particular attention to the level and direction of the background energy reflected from objects being measured. Both imaging and non-imaging radiometers convert the invisible infrared radiation emitted by an object into a temperature value. When measuring thermally opaque objects, the infrared energy collected by these devices is the sum total of energy emitted by, and reflected from, the target’s surface. When performing infrared inspections in areas with significant sources of reflections, it is important to understand and control sources of reflected energy to help eliminate both qualitative and quantitative errors. An example of an environment with significant background radiation would be the emergency generator room of a data center. Often this is a small room populated by one or more large diesel engines with attached generators. These engines have exposed high temperature exhaust manifolds and pipes, turbo chargers, and coolant pipes all of which radiate large amounts of heat during operation. The thermal reflections created by such equipment can make qualitative imaging difficult and significantly affect the accuracy of radiometric temperature measurements. Emergency generators are often located in close proximity to electrical switchgear and transfer switches which are the subject of an infrared inspection. When performing an infrared inspections in such locations, thermographers can minimize errors by shielding the measured object from sources of reflections. 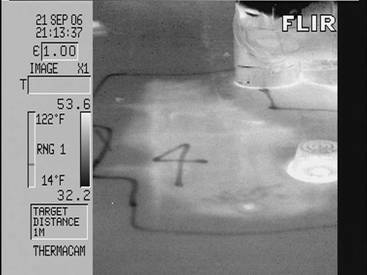 In some cases, a thermographer may use their own body to help shade or shield the target. As an alternative, it may be necessary to use a sheet of cardboard or other thermally opaque material to temporarily block the source of the reflected energy. When using a radiometer that has corrective inputs for reflected energy, a thermographer should measure and compensate for reflected temperature to further ensure measurement accuracy. The Infraspection Institute Standard for Measuring and Compensating for Reflected Temperature Using Infrared Imaging Radiometers provides simple and practical procedures for dealing with errors associated with reflected temperature. Copies of the standard are available through the Infraspection Institute Online Store . Wayne Swirnow is a Level III Infraspection Institute Certified Infrared Thermographer® and professional infrared consultant. Wayne specializes in commercial and industrial thermography as well as being certified by the Building Performance Institute as a Building Analyst. Wayne is the founder and owner of Infrared Imaging Services LLC a commercial infrared inspection company, headquartered in New City, NY. Not all contracts are expressly stated. Some are implied by law based on the relationship of the parties, and some are implied in fact by the parties’ conduct. In business, though, express contracts which state the important terms of agreement are the rule. Express contracts can be oral, written, or some mix of the two, and they are sometimes revised as performance progresses. It is entirely possible to change the terms of a written contract by subsequent oral agreement, unless the contract contains what is known as an integration clause. An integration clause, sometimes in a contract under the headings “No Oral Modification” or “Entire Agreement,” states that the written contract represents the entire understanding of the parties with respect to the subject matter thereof and no changes are valid unless made in writing and signed by the parties. Such a clause will knock out oral understandings, and even bar common-sense incorporation by reference of updated collateral documents. An integration clause will probably prevent you from successfully suing for any misrepresentations preceding the signing of the contract, knocking out your fraud in the inducement defense to the deceiver’s claims of breach. On the plus side, a well-considered integration clause manages the risk of misunderstandings, and is often a good idea when strangers are dealing with one another at arms’ length. By insisting on the rigor of written amendment, the parties can be sure of the four corners of their contract should a dispute later arise. Before you sign a contract with an integration clause, make doubly sure that all essential terms are in writing. For best results, a minimum inside/outside temperature differential of 10ºC is recommended when inspecting buildings with framed wall construction. Proper conduct of infrared inspections is addressed in the Standard for Infrared Inspection of Building Envelopes. Copies of the standard are available through the Infraspection Institute Online Store. With most thermal imagers capable of displaying images in monochrome or multicolor, many new thermographers ask which color palette is the best choice for effective imaging. The answer will depend on a number of factors including application, delta T associated with the exception, and personal preference. Because it is usually less confusing than multicolor palettes, grayscale may be better suited for some applications. Additionally, applications that have a large delta T associated with exceptions or where target recognition is important may be better suited for grayscale imaging. Such applications include electrical distribution systems, building envelopes inspected from the interior of the structure, and low slope roof inspections. Multicolor palettes offer an advantage when imaging targets having a small delta T associated with exceptions or when imaging targets with several discrete temperature zones. Typical applications include mechanical systems, refractory systems, building envelopes inspected from the exterior, and medical/veterinary applications. For hardcopy reports, printing monochrome images can result in lower cost than multicolor reports. Lastly, the choice to use monochrome or multicolor is largely a matter of personal preference. Thermographers should always use a palette which best represents the observed thermal patterns and provides data that are easily understood. Infrared camera operation is one of the many topics covered in the Level I Infraspection Institute Certified Infrared Thermographer® training course. For information on thermographer training including course locations and dates or our convenient Distance Learning Program, visit us online at www.infraspection.com or call us at 609-239-4788.